Diving Spain encompasses not only the dive spots around Spain itself but also the Canary Islands - a Spanish archipelago off the northwest coast of Africa. Most of the diving around Spain is in the Mediterranean Sea. This warm, temperate sea has very limited communications with other seas. The strait of Gibraltar - the gateway to the Atlantic Ocean - is both narrow and shallow. Water temperatures range from 14 oC to 24 oC in September. In summer you'll need a 5 mm wetsuit, in winter a 7 mm wetsuit or drysuit. Mediterranean common dolphin in the Alboran Sea, Photo credit: Rick Tesoro. When you dive in Spain it is compulsory to have scuba diving insurance to cover you for third party liability and medical recompression therapy. Make sure you take your policy documents with you. For specialist travel insurance with scuba diving down to 50 m or deeper, see our Insurance page. In Adalucia it is compulsory for every recreational diver to hold a dive medical certificate, filled in by a qualified doctor, renewable every 2 years. The Canary Islands are a Spanish archipelago in the Atlantic off the northwest coast of Africa. 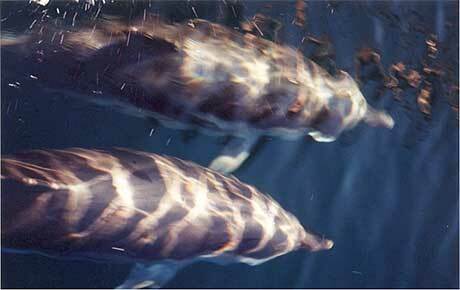 They have year-round sun and little rain, and are on the same latitude as Sharm El Sheikh in the Red Sea. It can be windy in the Canaries between June and August, giving rise to a swell. You can dive year round but perhaps the best time to go is between September and February when the weather is calm and the visibility good. Temperatures average 17 °C in winter and 24 °C in summer. You can fly to the Canary islands from all the major European airports. They comprise 13 islands, the major ones being Tenerife, Lanzarote, Gran Canaria, Fuertoventura, La Palma, El Hierro and La Gomera. All volcanic islands but very different. Underwater, the volcanic origins give rise to great formations - arches, caves, pillars. The diving, being in the Atlantic, can be more challenging than if you are used to diving the Red Sea or Mediterranean. In the Canary Islands you can see both North Atlantic species and Mediterranean species. There are also species endemic to the Canaries - those that are found nowhere else in the world. Together with their adjacent seamounts, the Canary Islands hold the most diverse community of sharks and rays of the whole European Union, with 79 species identified.1. 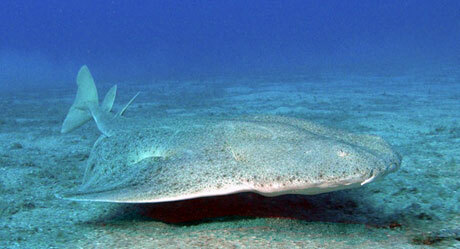 The angel shark (Squatina squatina), for example, was once common throughout Europe's seas but is now classified as extinct from much of its former range. One last stronghold remains in the Canary Islands but it is under threat from sportfishermen2. The Canary Islands are part of Macaronesia which also includes The Azores, Madeira and Cape Verde. Highlights of diving the Canaries? Some of the best dives include La Burrera, to the north of Lanzarote, with its masses of marine life; Baja Bocarones south of El Hierro, a great wall dive on two vertical towers; La Catedral in Gran Canaria, 30 m high lava structure full of caves and arches. "In the Canaries we've seen volcanic soil, no coral except for black corals but only starting from 30 m deep, and impressive underwater cliffs." Tenerife boasts the largest mountain in Spain at its heart in Mount Teide, which is 3718 m. In July longfinned pilot whales visit. Calmest on the southern side of the island. La Gomera Caves, interesting lava formations south of San Sebastian. Yellow gorgonian sea fans in Valle Gran Rey. La Palma Deep dives at las Cabras and Malpique pinnacles. Large grouper and manta rays. See also Tenerife Dive Operators. Los Gigantes, in the south west of Tenerife, is named for the 500 m high cliffs reaching down into the sea. A feature of this area is the large and abundant rays, due to a regular ray-feeding dive. There are large schools of smaller fish but generally little bottom or wall life except in very sheltered spots. The weather in Los Gigantes in Autumn and Winter is generally calmer than elsewhere in Tenerife. 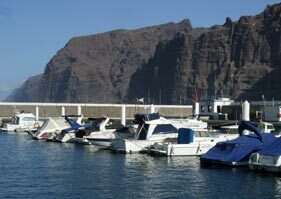 Barranco Secco (Dry Ravine) is around a 20 minute boat ride north from Los Gigantes marina. An interesting dive. Swim down a slope to 30 m. On the way you will see big shoals of fish: sea bream, grunts, sand smelt and a trumpet fish splitting shoals like a sheep dog. There is little bottom life though until you go shallower, returning to a small arch reaching from 9 to 5 m - full of trumpet fish and look out for the resident nudibranchs. You are also likely to see Rays. One of the dives offered in this area is a Ray-feeding dive, which means that they are large and plentiful. Additionally Atlantic chromis, some of which change colour from gold to silvery blue and back. Big shoals of fish on Barranco Secco. Large shoal of fish cascading down Barranco Secco. Extent of the shoal can be seen at around 12 seconds. Swim down the slop to a series of plates of rocks - flat, horizontal, with plenty of hiding spaces underneath. Rolf's cave is a small cave with an enormous tube worm about 3 cm in diameter. South of Barranco Secco, you can do both dives in one as a drift starting from Rolf's cave if conditions are right. A very distinctive dive. Dive from the boat own to a triangular plateau at 18 m. This is made up of hexagonal pillars like an underwater Giants' Causeway. Some very interesting formations made by volcanic larva cooling. At the end of the platform is a single pillar with several fallen-over blocks. Many different types of fish. You can get excellent vis on the Atlantis dives. Similar to Atlantis 1 with the basalt columns. This is the Ray-feeding dive. The dive centre takes two dustbins full of old fish to feed to the rays and any other fish who turn up. This attracts three types of ray: an enormous round stingray (Taeniura grabata) about 5 feet long; common eagle ray (Myliobatis aquila) with its head like a charging bull and the common stingray (Dasyatis pastinaca) which is diamond shaped. Although it is interesting to see so many rays at once, all the blood and dead fish particles in the water make the vis very bad. Round stingray, Photo credit: Philippe Guillaume. The dive is not far out from the cliffs by some small rocks. Further out there is an expanse of sand with hundreds of garden eels to which you can get close enough to see their eyes before they retreat into their burrows. Also flatfish and weaver fish. Descend down the anchor chain to around 25 m. Look out for rays and golden spotted snake eel (Myrichthis pardalis). At one time this was packed with fish, but no longer. However, there is still a nice gully, swim throughs and overhangs. Large Pinna rudis mussel on entry. A rocky pinacle with large shoals of chromis. Octopus Cove was previously known as Echo Beach but the owners of the local dive shop renamed it when they saw Octopus there on their first visit. There are no octopus to be seen there now. The dive is along a 10 m deep wall with encrusting coral at its corner. There are lots of black-spined sea urchins and some of the pretty arrow crabs (Stenorhynchus lanceolatus). "Clear water, big mushroom shaped rocks with loads of life." "Loads of stingrays and great view." You are likely to see large rays here who are not frightened of you as they are regularly fed. On a smaller scale look out for the lovely red-lipped blenny with its snakey body and quick movements.
" Vertical wall full of morays, stingrays, octopus, tuna, parrotfish, bogues, barracuda and angelsharks." "Deep dive. A lot of groupers, red and black coral, greats jackfishes and barracudas, sharks, stingrays, morays, tuna." "Beautiful reef. At the end there are a cave with a big and friendly grouper. There are morays, tuna, barracudas, trumpet, trigger fish, parrot fish, eels, giants anemone and stingrays." Puerto de la Cruz is on the north side of Tenerife, with black sandy beaches. It is quieter than some of the southern resorts. The weather is wetter and cooler than the south, but still warmer than continental Europe. In winter temperatures average 20 - 22 oC on the coast. "Reef in the open sea (unprotected, always current), upper rim at 8m depth, drops straight off to 37m on eastside and in terrasses to 42m depth on the westside. Little cavern and passthrough at 37m. Another part of this reef is further out and we call it Black Mountain. Wrasses, Sardines, Moray Eels, Barracudas, Tuna, Groupers and Amberjacks." "Horizontal volcanic lava tunnel cutting trough a reef. The Tunnel is about 60m long, 10m wide and 4m high. This tunnel- or cave system has a huge entrance and several exits on the other side. In the first third of the tunnel you find also a 3m wide hole in the ceiling where you can surface. At maximum depth at 20m on another reef in front of the main reef you find a little cave. In this cave you encounter a very nice sea anemone and a huge pile of eaten shells in the furthest corner of the cave. As nobody ever encountered the producer of this heap of shell garbage, we call the cave The Cave of the Evil Beast!." Some of the best dive sites in Lanzarote are near Puerto del Carmen, for example the Cathedral and the Hole which are both between 20-30 m. There are eight purpose-sunk shipwrecks near the old harbour. See also Lanzarote Dive Operators. "The top of reef is at approx 18 m and the bottom at about 24-27m. Large groupers, rays." "The Entry is by Playa Chica and free descent to the drop off at 20 meters. Down and to the left side we can find the Cathedral. The Cathedral is a huge dome full sponges, knobby corals, anemones and Tube worms . As we ascend over the reef we will see a beautiful bubbles curtain coming up from the bottom providing a very special view of the blue ocean. " "30m shore dive. fin out from bay, past house reef (groupers, bream, angel sharks, wrasse and parrot fish) drop down to 20m and then over overhang to cathedral opening at 30m. Yellow sponges in rear of cave. Ascent up onto 20 m area and slow fin back to bay." "Entry through the harbour down the sand slope down to the reef. It's an amazing swimming through the reef that leads down and out the other side into the blue ocean. This dive is between 20-30 meters. also a perfect site for the first night dive. " "Entrance from the boat or the beach. 0-18m. It is a very easy dive and is so beautiful because of the big soles of Grunts, Breams, Mullets, Bogues, tunas, jacks and barracudas. On the white sand is very easy to find also stik rays, angel sharks and electric rays and inside the wall of rocks we can look for the groupers and many other species. " "Night dive with Safari Diving, Puerto Del Carmen. A must a one hour evening dive following cuttle fish feeding, octopus, star gazers, rough tailed rays"
Dive sites around Gran Canaria include caves and wrecks. On the East coast at Arinaga is the marine reserve of El Cabron. Elsewhere, one of the highlights is La Catedral. See dive operators in Gran Canaria. The marine reserve features around 12 dive sites. Most of these are shore dives. You can dive here year round but the best diving is in the summer, when the water is warmer (up to 25 o). It is rich in invertebrates, five types of ray, seahorse and large shoals of fish. Sometimes you can see visiting angel sharks. "Marine reserve in Gran Canaria"
"A calm dive site in the South of the Island"
Lovely dive site with arches, walls and caves. A good place to see nudibranchs, reef fish and bigger fish like barracuda. A boat dive, this rocky outcrop is accessible from Las Palmas de Gran Canaria in the northeast. "Really cool dive, just off the beach, outside from Canary Diving Adventures . Depth 6-7 meters. Volcanic reef and a lot of fish." " Two really nice wrecks, on a depth of 18 meters. There were already a anchor line on the site, which made the ascent and descent super easy. " " Good drift dive along the mountain. Here you have a good mix between rocky reef and sandy bottom. on the reef, you find octopus, and a lot of life. 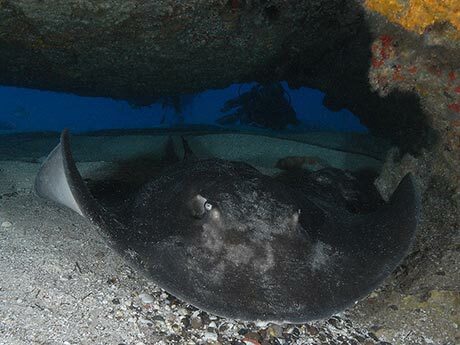 on the sandy bottom, you have a good chance to find rays and angle sharks "
One of the most southerly dive sites, Reef Pasito Blanco has plateaus, overhangs and ledges. Covered in soft corals you will often see a stingray (Chucho). Large shoals of damselfish sometimes get in the way of the view. This one is off the north coast of Gran Canaria. A shore dive, the entry point is a large, sheltered harbour. It is a good place for a night dive. See also Ibiza Dive Operators. "Among the biggest shipwrecks in Europe, 'Don Pedro' is a must-visit dive site in Ibiza. It sunk in 2007 and it is already booming with marine life. Highly recommended!" The Illes Medes are a marine reserve which has some of the best diving in Spain. These tiny islands are reached by boat: the nearest launch site is L'Estartit, Costa Brava. See also Dive Operators visiting Illes Medes. "Named for the little dolphin statue, its a system of caves through one of the Medes Islands in the marine reserve, full of groupers and bream, with beautiful gorgonian corals and eagle rays cruising by. " "Another Medes Island dive, going as deep as 55 meters, but at 18 to 25m you meet the friendly groupers and feel like you're swimming in an aquarium! Wonderful corals and rays here too. 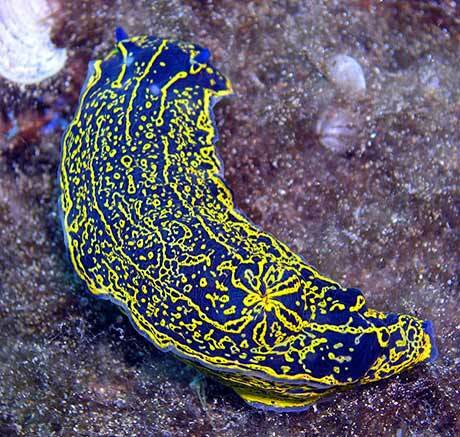 The other Medes Islands dive sites (13 in all) are great and well worth a visit. " "A stride entry off rocks into the sea. Depths from 8 metres to 19 metres with three large outcrops of rocks giving home to an abundance of life including moray eels, wrasse, bream, mullet, soft coral and octopus." "A sea dive suitable for Open Water or Advanced divers. Plenty of life around the rocks, including a resident conger eel, scorpionfish and plenty of nudibranch. More experienced divers can venture a little further to explore the sunken fishing boat and two cars!" "This wide bay really has something for everyone. Superb for beginners with lots of interest even in the shallower water. Depth ranges between 8 and 25 metres with huge rocks and large crevices in the cliff face. Octopus, sunfish and eels will be seen. Be aware that the current can be quite strong at times around the point." "In the Nordwest of Spain there is one special area for scuba. In the seabed may be necoras, crabs and shellfish, also many fish, sea anemone, algae and dems lifestyles. There octopuses, cuttlefish, lumbrigantes, robalizas, triggerfish, red spots, morays, congers. Many live animals are very striking. There is a wreck. " Hotel MARITIM, El Burgado, 1. 38410 Puerto de la Cruz / Los Realejos. Tenerife. Islas Canarias. Tel. : +34 922379000. Fax: +34 922379037 . E-mail: info@hotelmaritimtenerife.com. Hotel at Dive Centre ATLANTIK. 4 stars. Rooms, studios and apartments. Holiday homes on Majorca and Minorca: villas, apartments and farmhouses for rent in the Balearic Islands. Hotel Varadoiro, C/Rafael Pic� 42 a 36970-Portonvo.. This hotel is in Portonovo, In winter, spring and autumn, Bed and Breakfast, 25 Euros one person. Lanzarote is the most easterly of the Canary Islands, which lie off the northwest coast of Africa. The hottest of the Canary Islands, temperatures in Lanzarote are warm throughout the year with August being the hottest - average temperature 25oC - and January the coolest - average temperature 17oC. Sea temperature ranges from 22oC in August to October down to 18oC in February and March. You can dive Lanzarote year-round. Diving is both by boat and from the shore. The Canary current, which flows from North to South along the African Northwest coast, passes the Canary islands and brings with it nutrient-rich upwellings. This makes for an area of extremely diverse and productive sealife. 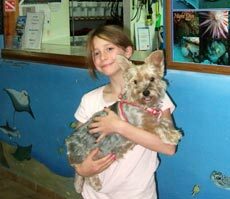 Friendly, professional dive centre, customer focused on safe fun diving for beginners to pros and tec divers alike. PADI 5* IDC & TecRec Centre and TDI Tec Centre. Rebreather & sidemount friendly, with a resident trimix instructor and guide on staff. 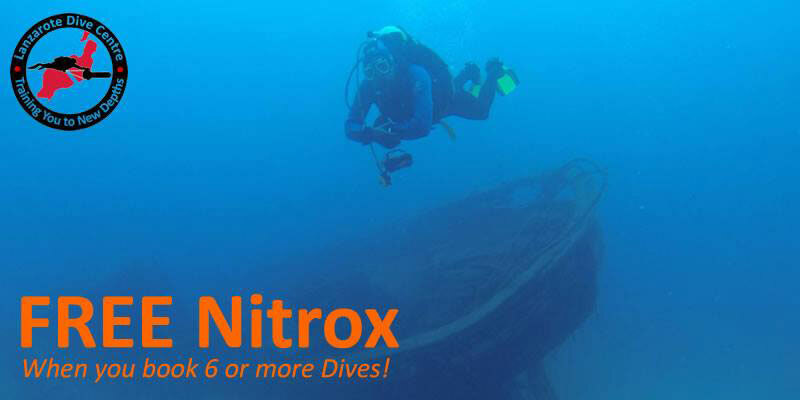 FREE Nitrox with all pre-booked 6+ dive packages. "Safari are based directly on the beach, international team of very competent guides, knowledge of local flora and fauna and marine environments is amazing. Team are definitely 100% customer focused and there are no hidden costs at all. We have dived with the team on 3 separate occasions (35 dives)and will again. The dive centre has on two occasions booked our accommodation, �200 for a week's self catering accommodation 2 minutes stroll from the centre. Boat dives each day (at no extra cost), without a shadow of doubt a fantastic value for money dive operator. The centre will help with booking your holiday. Dive courses available for PADI, BSAC, SSI etc." " We are a 5 Star PADI diving school in Canary Islands, Spain. 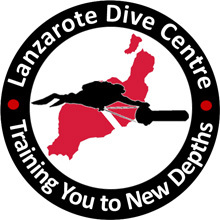 We have two diving centers around Lanzarote, one located in Costa Teguise (15th years ago) and we recently opened a new one (June, 2014) in Puerto del Carmen, just in front of the beach considered one of the best places to dive in Europe. We have very good prices including the hotel. " 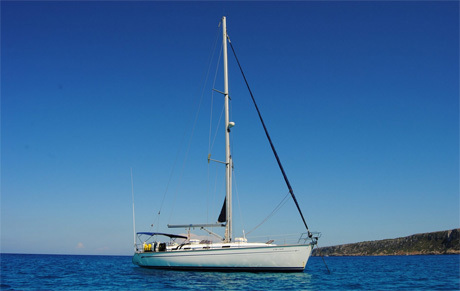 This beautiful yacht visits the seas around Tenerife and Gomera. She takes up to 8 divers plus the captain and divemaster. In addition to diving, you can learn to sail. "We are a PADI 5 Star Gold Palm IDC Centre and a BSAC Dive Training Centre. Duty free equipment. Accommodation and airport transfers arranged." PADI 5 star IDC centre in South Tenerife. All organisations welcome. Offer scuba diving for beginners to Instructor levels. On-site NITROX facilities available. Duty free equipment sales. Accommodation and airport transfers arranged. In the town of the same name in South West Tenerife around 45 minutes from the airport. Run by Sheila Widdrington, aided by Shakira the dog. Offer BSAC and PADI courses. The dive shop is on the harbour and the dives almost all boat dives. Dives normally depart twice a day at 10 am and 2 pm (closed on Sundays). Have two boats, one a wooden hardboat for 10 people and the other a zodiac RIB. "We've been in Las Galletas, and we did some dives with scubayaci diving centre; it was so great and incredible; diving with seaturtles, rays....; and Yaci was soo funy, and an excellent instructor; really we recommended this dive centre to anyone, for a non divers, training courses, and experienced divers!! !it's soo safty, professional, and funny!!!!!." Diving education from beginer to Instructor by CMAS and PADI and SSI, TEC Diving and TEC courses by Pro Tec, Rebreather, Trimix. 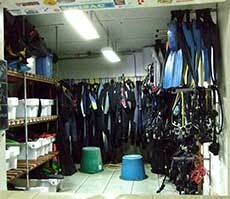 Scuba Shop. German, Spanish and English spoken. Most of the dive centres are in the south of Gran Canaria or around the capital - Las Palmas de Gran Canaria. See dive sites of Gran Canaria. "Fantastic dive school with fantastic dive sites! Great value for money. " "Great dive center, and people working there. Super professional and very safety minded. Jerry and Canary Diving Adventures have an amazing new boat, with plenty of space and you can see that they are taking really good care of it. I really got my money worth. And even more. The staff really made me feel safe on every single dive. " Learn to scuba dive with Dive Academy Gran Canaria a sea-front Padi 5 star IDC Centre and Gold Palm resort, we have our own large private pool for training or if experienced just come diving with us by boat or shore. All Padi course available. PADI 5 Star IDC Dive centre located in the beautiful seaside town of Moraira on the Costa Blanca, Spain. Daily Boat dives, Night dives and Cavern dives. Mark Griffin - BSAC instructor. Cover the Benalmadena costam diving in Fuengirola, Malaga and throughout Andalucia. Offer recreational scuba dives for already certified divers, along with a range of scuba diving courses, in and around Almuñécar and the bay of La Herradura. Cater for small groups and individuals of all ages and abilities. As registered Emergency First Response Instructors they also offer First Aid Courses that are applicable both when diving and in normal day-to-day life. Padi Dive School, operating in the Costa Tropical, Southern Spain. Dive in La Herradura, Almunecar, Salobrena, Motril, Calahonda etc. Teach all Padi courses and guide fun dives as well. Only small groups. Will pick you up at your accommodation and return you there. Speak English, Dutch and basic German. Dive the Medes Islands. PADI Courses from Open Water through to the professional Divemaster qualification and Internships. Specially subsidised student internships for those seriously seeking marine research fieldwork experience in our conservation research projects. "Kenna Eco Diving on the Costa Brava supports marine conservation research and is great to join for subsidised volunteer diving trips and dive holidays. It's run by lovely people too." 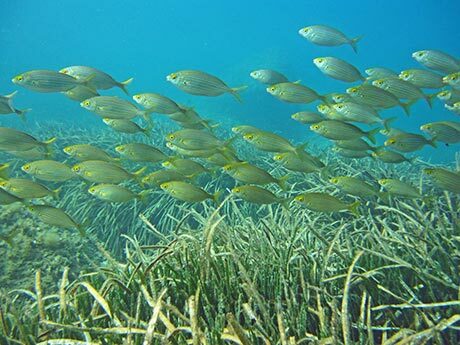 Cow bream (Sarpa Salpa) over seagrass (Posidonia oceanica). Seagrass is often referred to as the "lungs of the Mediterranean" as the seagrass meadows absorb carbon dioxide and output oxygen at twice the daily rate of tropical forests. Read Posidonia in Peril Article by Gaye Rosier of Kenna Eco Diving. One hour from Barcelona, Costa Brava. Air and nitrox. Offer reduced prices on apartments, hotel and campsite. "Very poor organisation couldn't tell which dives they were doing which days. Just seemed to be lucky dip. Worst Padi centre I've used give them a wide berth. " by Lawson Wood, 128 pages, New Holland Publishers, 2019, Paperback. 1 Strange marine animals found around the Canary Islands, SCUBA News, 9 October 2014. 2 Angel Shark Project, ZSL Living Conservation, accessed 10 March 2015. Please send us your comments on Spain. Do you want to recommend a diving centre or dive site? Let us know. If you own a dive centre get yourself added.